In Ayurveda, the traditional Hindu system of medicine, the causes of arthritis are an accumulation of ama or toxins and aggravated vata (dosha type) paired with weak agni (digestive fire). Since the main dosha associated with arthritis is vata, most treatments call for these vata-pacifying remedies. What is ama and how does it affect arthritis? Ama is defined as the sticky, toxic waste or by-product in the body that can cause an array of health issues, arthritis being one of them. It is drawn into the digestive tract, where it permeates the intestinal wall, moves through the body, and lodges into the bone tissue and joints. This causes pain, inflammation, and stiffness. 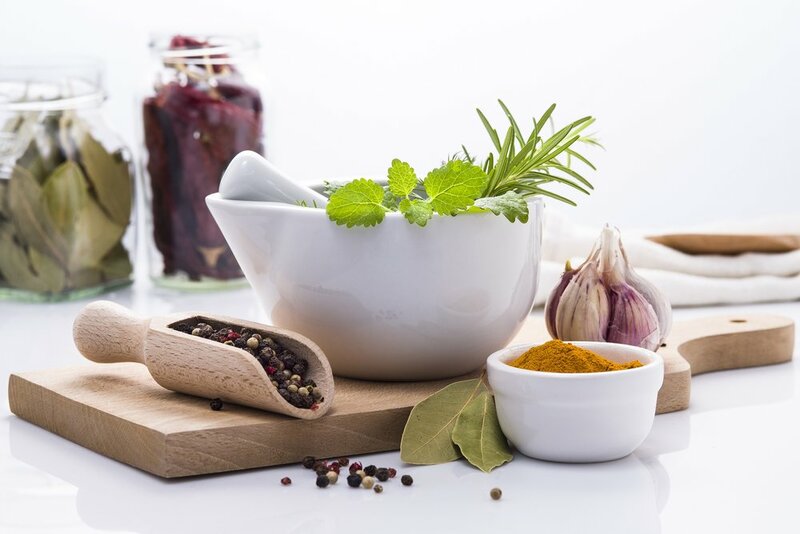 The main protocol for healing arthritis is to dislodge the ama from the joint, bring it back into the colon to be eliminated with various herbs, remedies, and cleansing treatments. Abhyanga Massage: Daily Abhyanga (oil massage) is one of the best preventions for degenerative arthritis. You can receive an abhyanga massage from a trained ayurvedic therapist or at home with a self-massage. 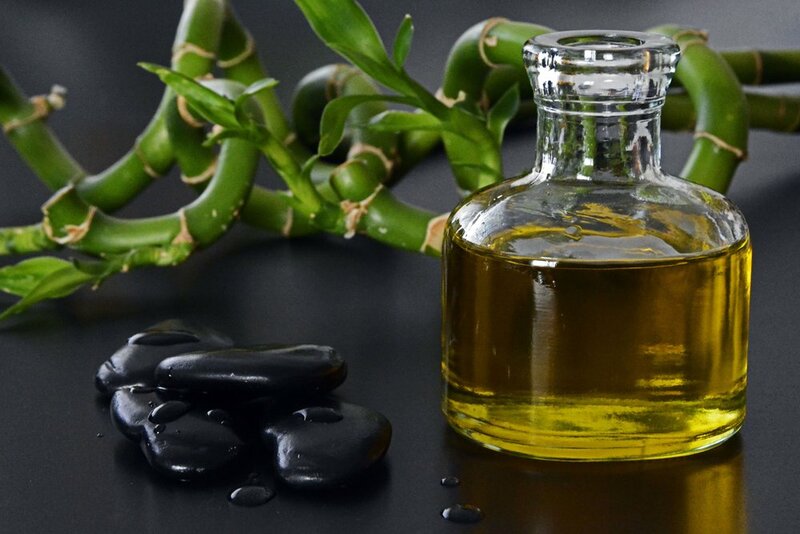 Heat approximately 1 cup of oil (preferably organic sesame oil) and cover the entire body from scalp to toes. Using vigorous long strokes on the larger areas of the body like the thighs and forearms, and circular movements on the joints, rub the oil into the tissues with the intention of dislodging ama. With self-abhy the strokes should feel firm, yet pleasant — never painful. Massage for at least 10 minutes per day. Take a hot bath with Epsom salt to draw out impurities from the body afterward. Castor Oil: commonly used in Ayurveda as a go-to treatment for countless conditions including rheumatoid arthritis. The compounds in castor oil have a similar effect as steroids, preventing inflammation. Used to treat swelling, stiffness, and pain in the joints, this oil can be used externally and internally in small amounts (due to its laxative effect). Rub castor oil mixed with turmeric on the affected joint. Wrap the area with a dishtowel or plastic wrap. Place a hot water bottle over the joint. Keep in place for about 10 min (depending on comfort level). Tip: Always listen to your body. You should feel relief from this, not pain. If the pain increases with heat (it might be due to a pitta inflammation), try an ice pack. Pranayama: Yogis have used the ancient practice of pranayama (breathing techniques) for millennia as a treatment for healing a myriad of illnesses, including arthritis. Make a "straw" with your tongue. Breathe deeply through your mouth and "drink" the air into your belly. Hold the breath for 7 seconds; then exhale through your nose. Meditation: Arthritis is exacerbated by stress and anxiety. Meditation is an important technique for stress management, heightened mental function, and emotional stability. Connect with your breath, following your inhalation and exhalation without forcing or straining. If your mind begins to wander, simply come back to the breath. That's it – you're meditating! Easy isn’t it? Detox Diet: There are various detox cleanses used for different types of arthritis. Water fasting is sometimes prescribed as a way to eliminate ama. The length of the fast depends on your strength, health, and the season and location. There are also detoxification diets using mainly vegetables, juices, spices, and herbs. These cleanses typically last until the body shows certain signs that the agni is burning strong again. For example, return of appetite, loss of fuzzy white coating on the tongue, and a feeling of lightness all indicate that the cleanse is complete. In 12 ounces of warm or hot water, add 2 teaspoons of lemon or lime juice. Add 1 teaspoon of raw organic honey and stir. Add one tablespoon of extra virgin olive oil (optional, but highly recommended). Add a sprinkle of cayenne pepper (optional). Drink in the morning before meals and in the evening before bed. Heat Therapy: Using a steam room or sauna can help to expel impurities from the body. Heat can also be applied directly to the afflicted areas for relief. Try this: Swedna is an ayurvedic treatment that uses a steam tent placed over the massage table after a full body oil massage. The ama binds with the oil and is sweat out through the pores. You can also simply sweat it out in a bath, sauna or steam room. Yoga Asanas: Yoga is one of the most practical ways to prevent and treat arthritis. Stretches and poses should be done gradually and with care. Never do anything that is painful. The great thing about yoga is that there is a modification for almost any pose. Little by little, the flexibility of the joint will improve, as well as circulation and strength. This herb is used as a traditional treatment for many inflammatory diseases such as rheumatoid arthritis. One study done at the Indira Gandhi Medical College in Nagpur, India, reported that all patients receiving Boswellia Serrata had a decrease in knee pain, increased knee flexion, and increased walking distance. The frequency of swelling in the knee joint was also decreased. This sticky gum-like resin from the mukul tree is loaded with powerful antioxidants and is considered tri-doshic, meaning beneficial for all three doshas. Guggul has unique healing properties, which reduce pain and inflammation caused by arthritis as well as increased white blood cell count. Providing yumminess in curries is this herb's claim to fame, yet its benefits are bountiful. It's often referred to as the “Golden Goddess” of herbs and hailed for its efficacy in treating inflammation and rheumatoid arthritis. According to a study by the Journal of the American College of Rheumatology, turmeric root prevents the onset of rheumatoid arthritis. Furthermore, curcumin also acts as protection against bone loss in the joints. This member of the pepper family is frequently used in Ayurveda as a treatment for inflammatory conditions to boost the immune system, and as a stress buster. Ashwagandha is one of the herbs in that incredible category of substances called adaptogens, which help the body cope better with stress and balance out the hormones — moving the body toward homeostasis and more vital energy. Typically used for improved digestion, this Ayurvedic herbal blend may also be a beneficial treatment for joint pain, arthritis, muscle aches, and rheumatism. The components of triphala are believed to bind to the toxins and then eliminate through the blood stream and digestive tract. Also known as amla or “Indian gooseberry,” amalaki has been celebrated for its rejuvenating properties in Ayurveda for ages. Amalaki is another amazing adaptogen and is packed with powerful antioxidants. It is praised for its anti-aging capabilities, which help reverse the symptoms associated with arthritis. In Ayurveda, there is emphasis on creating a daily routine in conjunction with the cycles of the sun and moon. Each dosha has a specific time that is optimal for rising in the morning and sleeping at night. Sleep is one of the key factors in healing arthritis, as proper sleep patterns maintain a healthy nervous system and help our bodies to heal naturally. Bess O'Connor is the founder of Urban Wellness Magazine. A holistic, natural lifestyle is what she's all about. She has studies in many healing traditions and is an Ayurvedic and Holistic Health Practitioner and worked as a Healing Arts Master for the Chopra Center for 8 years. To her, WELLNESS is short for: Water, Exercise, Love, Light, Nourishment, Energy, Sun & Spirit. Connect with her on Facebook and Twitter.